Independent professional services company Turner & Townsend won the three-year contract, which will see the firm provide services including estimating, benchmarking performance, commercial reporting and cost management as the scheme is taken into construction. The project is currently undergoing consultation on Highways England’s preferred route. The consultant has also been appointed to deliver the next phase of two of Highways England's smart motorway upgrades, providing commercial and programme management for improvements to the M6 between junctions 21a and 26 and M62 between junctions 10 and 12. Turner & Townsend hilighted that delivery of this smart motorway programme, will include 'an extensive upgrade of the existing drainage system, new emergency areas between junctions, a new ducting system for power and fibre cables, and work to overhead signs to provide electronic signs for CCTV and driver information systems'. 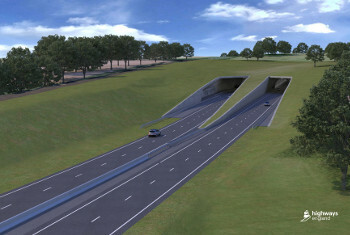 Gary Healey, director at Turner & Townsend, said: 'The A303 upgrade is one of the most significant schemes set to be delivered under the Government’s Road Investment Strategy – creating a better experience for road users, improving economic connectivity across the south, and reducing the visual impact of this key arterial route on Stonehenge itself. Highways enquired about the value of the contract but at the time of publication had not received an answer.